This Holy Family features Mary holding her baby Jesus while riding a donkey. Joseph stands next to her, leading the donkey by a rope. The dolls are made from scraps of cotton cloth stuffed with cotton filler. The hair is made from yarn and the faces are embroidered. Mary on the donkey has a height of 6.5 inches. These dolls are made by Hilda, who lives in a very isolated rural community called Trujillo in eastern Honduras. She made these dolls while pregnant with her 7th child, due in January 2010. 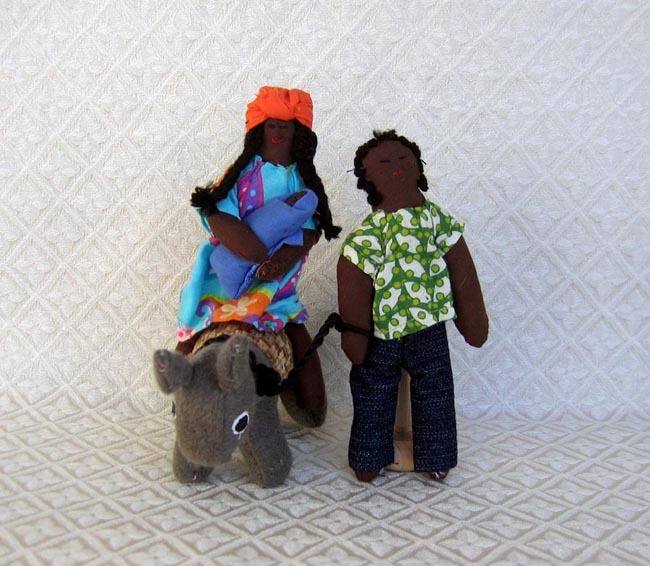 Hilda made other styles of cloth dolls before we suggested she try a Holy Family—she loves making these sets now. Hilda made these in her kitchen, which has a wood-burning mud oven where she makes tortillas for her family. Hence, the dolls have a faint smoke odor from the burning wood. We find this feature to greatly enhance the dolls.